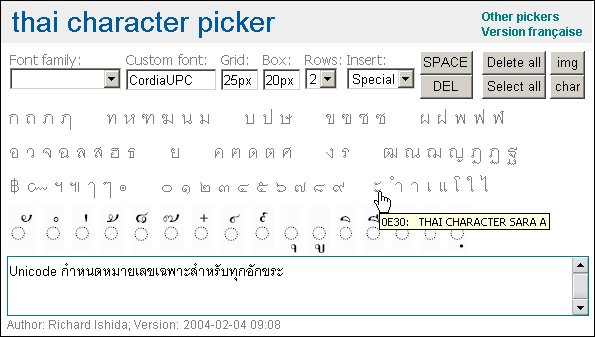 The Unicode character pickers display the characters that are used for a range of languages, and allow you to compose one or more words by clicking on characters. The languages available include Arabic (including Persian and Urdu), Armenian, Bengali, Devanagari, Ethiopic, Gurmukhi, Hebrew, IPA, Latin (with diacritics), Malayalam, Myanmar, Tamil, Thai and Tifinagh. More languages are planned. Characters can be displayed as graphics or using an installed font, and their size can be altered. Other characters can be added by typing. The resulting text can be copied and pasted into other applications. The Unicode Character Pickers are produced by Richard Ishida, and are available at ishida >> utilities: Unicode character pickers. 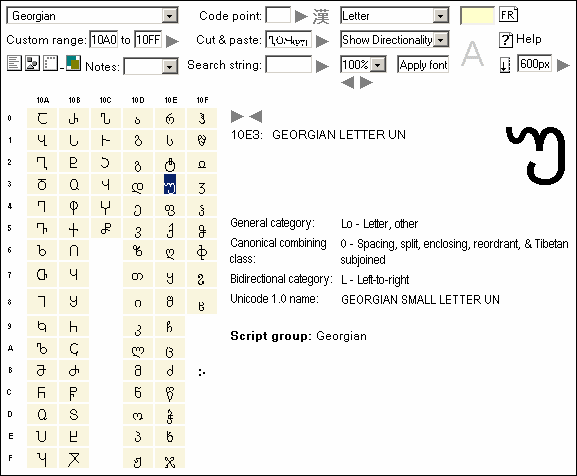 UniView is a Unicode character viewer that can display characters from a selected range using an installed font or as graphics. Characters can be selected so that their details are displayed, or copied into a text box from where they can be copied and pasted into other applications. It supports the supplementary planes as well as the BMP. UniView is produced by Richard Ishida, and is available at ishida >> utilities: UniView.